With the current flood crisis engulfing Townsville and the resulting concerns about disease, it might be a good time to draw attention to a significant incident from Townsville’s past. In 1910, the Australian Institute for Tropical Medicine (now succeeded by the Australian Institute of Tropical Health and Medicine) was established in Townsville. Its laboratory, which is now heritage listed, was opened in 1913 by the Queensland Governor Sir William MacGregor. Its first director was the Austrian scientist Dr Anton Breinl, who had previously worked at the Liverpool School of Tropical Medicine and helped develop a treatment for sleeping sickness. He pioneered laboratory science, especially biochemistry, in an Australian context. The Institute was established in response to the concerns of medical practitioners and members of northern communities about the inability to control tropical disease. Dengue fever was especially rampant. 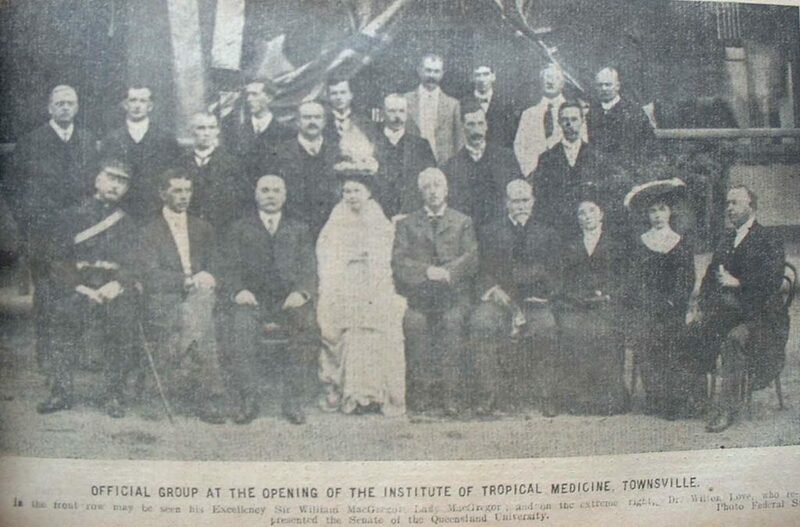 Early tropical medicine was also influenced and motivated by British imperialism,especially the idea that Europeans were unsuited to tropical climates. The Anglican Bishop Dr George Frodsham first proposed the idea of an institute for tropical medicine, after one of his staff died of a mysterious illness. The discovery of malaria parasites in Cairns also provided a further impetus. The Institute investigated numerous diseases, including malaria, dengue fever, typhoid, leprosy, amoebic dysentery, yaws, filariasis, and tropical sprue. It closed in 1930. By the First World War, it was already suffering due to the difficulty of retaining adequate staff during wartime and xenophobic concerns regarding Breinl’s heritage. In 1920, the Institute was incorporated into the new Commonwealth Department of Health.